Another home game. Another loss. The St. Louis Blues at least gained a point, but lost to the Vancouver Canucks 4-3 in overtime Thursday evening at the Scottrade Center. 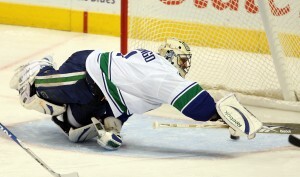 The Canucks scored four straight goals after the Blues jumped on top 3-0. Christian Ehrhoff scored the game winning goal 2:24 into overtime after Brad Boyes was sent off for a double minor of high sticking just 19 seconds into the overtime period. Andy McDonald scored a goal and an assist for the Blues, and Keith Tkachuk and Alex Steen also scored. Vancouver rallied scoring a late goal in the second period than added a short-handed goal in the third. With the loss, the Blues have now dropped four in a row and eight of its past nine on home ice at the Scott. Good news for defensemen Roman Polak. He was named to the Czech Republic Olympic team. Team USA will announce their roster on January 1st.